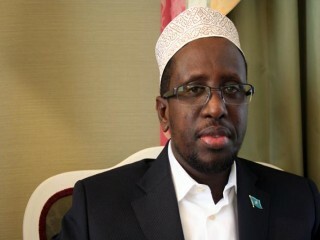 Sharif Sheikh Ahmed is the current President of Somalia and former Commander in Chief of the Islamic Courts Union (ICU). Ahmed was born in the Shabeellaha Dhexe province of southern Somalia, and studied at Libyan and Sudanese universities. Sharif Ahmed began his education at the Sheikh Sufi Institute, which was associated with Al-Azhar University in Egypt. He then went to Sudan and entered Kordufan University in late 1992, where he pursued a Bachelor's degree in the Arabic language (major) and geography (minor) in the city of Aldalanj. In 1994, the university was renamed to the University of Dalanj, and Sheikh Sharif left for Tripoli, the capital of Libya, after having completed only two out of the required four years. In Libya, he entered the Open University where he earned a Bachelor's degree in Law and Islamic Shariah, graduating in 1998. He has worked as a secondary school teacher of geography, Arabic, and religious studies. A hafiz, Ahmed had memorized the Qur'an by heart as a child and spoke only standard Arabic shunning slang and local dialects. Thus, his religious upbringing and education allowed him to succeed his father as the spiritual leader of the Idriseeyah sect of Sufi Islam in Somalia. Besides his mother tongue Somali, Ahmed is fluent in Arabic, and has some command of Italian and English. By 2004, Sheikh Ahmed had become one of the leading figures in the Mogadishu Islamic Courts. His closest friends and allies included Sheikh Hassan Dahir Aweys, one of the founders of the ICU, and Aden Hashi Farah "Eyrow", a man whom Washington alleges has connections with the Al-Qaeda network and fought in Afghanistan in 2001. On September 9, 2006, under the auspices of Abdiqasim Salad Hassan, the former President of the Somali Transitional National Government, Sheikh Ahmed and several colleagues attended an AU ceremony in Sirte, Libya, marking the seventh anniversary of a summit of African leaders. In an interview with Reuters and the BBC, Sheikh Ahmed suggested his delegation would seek the help of Libya and other African nations to bring about a rapprochement between the Islamists and the Somali Transitional Federal Government (TFG). However, he reportedly arrived in Khartoum, Sudan 48 hours before the start of the conference between the Somali government and the ICU only to leave 24 hours later. Sheikh Ahmed said Ethiopia had been hostile to Somalia for more than 500 years, and reiterated a long-standing Islamist accusation that Ethiopian forces were intervening in Somalia. Ethiopia denied any of its troops were fighting in Somalia. However, arrangements for an Intergovernmental Authority on Development (IGAD)-led peacekeeping force did not materialize. On December 28, 2006, after only six months in power and the defeat of the ICU's army, he committed himself to fighting the Ethiopian forces in Somalia. After the ICU's defeat in the Battle of Jilib and their abandonment of Kismayo, he fled towards the Kenyan border. He met the US Ambassador to Kenya for talks regarding cooperation with the TFG. He was under the protection of Kenyan authorities staying at a hotel in Nairobi. As the first round of voting began, several candidates withdrew, increasing the speculation that the vote would largely be a choice between Nur Hassan Hussein and Sharif Ahmed. In the first round, Sharif Ahmed received 215 votes, Maslah Mohamed Siad got 60, and Hussein obtained 59. Hussein then withdrew his candidacy, thus likely sealing the election of Sharif Ahmed as president. In the final round of the presidential election, Sharif prevailed with 293 votes. On October 14, 2010, President Sharif appointed former First Secretary in the Somali embassy in Washington, Mohamed Abdullahi Farmajo, as the new Prime Minister of Somalia. A row between the President and the Speaker of Parliament Sharif Hassan Sheikh Aden then developed over whether the scheduled vote of confidence on Mohamed's nomination should be decided by a show of hands or via a secret ballot. Sharif Ahmed favored hand-raising while Sharif Aden preferred a secret ballot, with the deciding voting session repeatedly postponed. The Supreme Court of Somalia subsequently ruled that the vote should be conducted by a show of hands, consistent with how previous confirmation votes in parliament had been decided since 1960. A delegation from the UN, AU and IGAD, including the Special Envoy to Somalia, also flew in to attempt to help resolve the impasse. On October 31, 2010, the vote of confidence was held, with lawmakers overwhelmingly approving Mohamed's appointment as Prime Minister. 297 of the 392 Members of Parliament endorsed the selection via hand-raising; 92 MPs voted against and 3 abstained. United Nations Secretary General Ban Ki-Moon also issued a statement commending the Somali leadership for having reached a consensus on procedural arrangements that facilitated a transparent and consultative confirmation of the new Premier. On June 19, 2011, Mohamed Abdullahi Mohamed resigned from his position as Prime Minister of Somalia. Part of the controversial Kampala Accord's conditions, the agreement would also see the mandates of the President, the Parliament Speaker and Deputies extended until August 2012, after which point new elections are to be organized. In his farewell speech, Prime Minister Mohamed indicated that he was stepping down in "the interest of the Somali people and the current situation in Somalia". He also thanked his Cabinet for its efforts in improving the security situation and the standards of governance in the country. View the full website biography of Sharif Sheikh Ahmed.